The new £23 million flagship John Lewis store in High Street, Cheltenham has been eagerly anticipated and is expected to bring visitors flocking to the town when it opens its doors on October 18. Stagecoach West runs frequent Park&Ride bus services into the town centre from Arle Court and Cheltenham racecourse and provides a stress-free travel experience for customers who want to avoid driving through the traffic to the busy town centre car parks. Shoppers can park their cars for free at the two Park&Ride centres and get return bus tickets for two people for one day for just £4.80p. Easily accessible from the M5 and A40, Park&Ride provides a direct bus service up to every 10 minutes bringing shoppers right into the heart of Cheltenham. 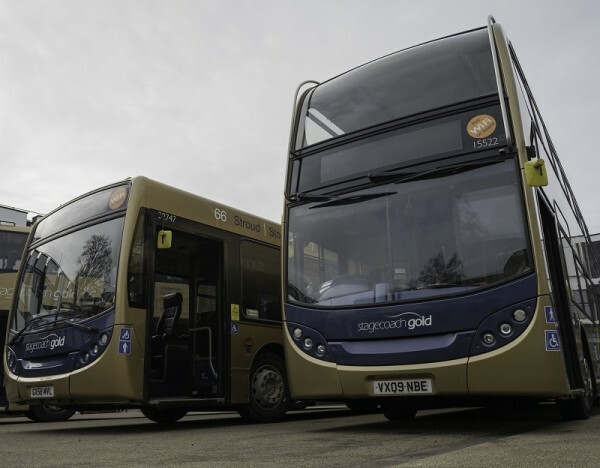 Stagecoach West took over Arle Court Park&Ride earlier this year and invested £1 million in four new luxurious Stagecoach Gold buses to run on the route, providing a touch of luxury, including Italian-designed leather seats, free wi-fi and USB charging facilities. Cheltenham’s dedicated bus lanes will help to speed up the journey. And all Stagecoach West services have contactless payment so customers have the convenient option of using debit or credit cards. Stagecoach West Managing Director Rupert Cox said: “The opening of the new John Lewis store has caused a lot of excitement in the Cheltenham area and will, I’m sure, enhance Cheltenham’s reputation as a major retail centre. “With free parking, the Park&Ride services operated by Stagecoach West offer a convenient and money-saving alternative to driving into the town centre and customers can beat the queues. Stagecoach West is a bus operator providing services in Gloucestershire, Wiltshire and South Herefordshire, in the west of England.